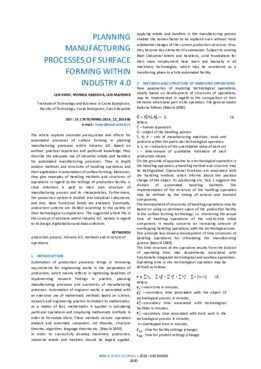 The article explores essential prerequisites and effects for automated processes of surface forming in planning manufacturing processes within Industry 4.0. Based on authors’ practical experience and profound knowledge, they describe the adequate use of industrial robots and handlers for automated manufacturing processes. They in depth analyse methods and structures of handling operations and their application in automation of surface forming. Moreover, they give examples of handling methods and structures of operations in regard to the settings of production facility. A close attention is paid to their own structure of manufacturing process and its characteristics. Furthermore, the production system is divided into individual subsystems, and also, basic functional bonds are analysed. Eventually, production systems are divided according to the variety of their technological competences. The suggested article fits in the concept of solutions within Industry 4.0, namely in regard to its design, digitalization and data collection.